Suzanne A. Cruser, age 69, passed away May 3, 2017 at her home in Sunrise, Florida. 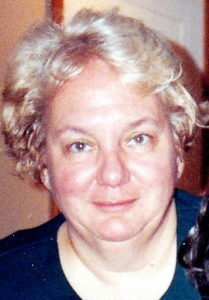 She is the beloved wife of Charles L. Cruser and stepmother of Paul Cruser. She is also survived by her brothers, Pierre and Jacque Roussin. She is also survived by her grandson, Keian Cruser. Friends may call on Thursday May 11, 2017 from 2:00 to 5:00 p.m. at Horizon Funeral & Cremation Services, 4650 N. Federal Highway, Lighthouse Point, FL 33064 and on Monday May 15, 2017 from 9:00 a.m. until service time at 11:00 a.m. at the Cherubini McInerney Funeral Home, 1289 Forest Ave. Staten Island, NY 10302. Interment will follow at the Moravian Cemetery on Staten Island. Sincere condolence to Charlie, Jacques, Nicole and children; to Pierre , nephews and cousins . Suzanne was my dearest friend ; we shared many memories during 55 years and I will always love her. Farewell my dear friend; I will keep you in my heart. There’s no word that can express how sorry we are to hear about the death of our beloved cousin Suzanne. We were very stunned to hear this news and still can’t believe that it really happened. Our thoughts and prayers are with you and your family during this difficult moment. May she rest in peace….